Dont just stick to tea and pakoras when the rain clouds gather. Add variety to your monsoon snack list, say experts. Noah Barnes, Executive Chef at The Hungry Monkey, Naresh Guglani, Corporate Chef at Del Monte, and Neeraj Balasubramanian, Executive Chef at The Park, Visakhapatnam, suggest some snacking ideas. 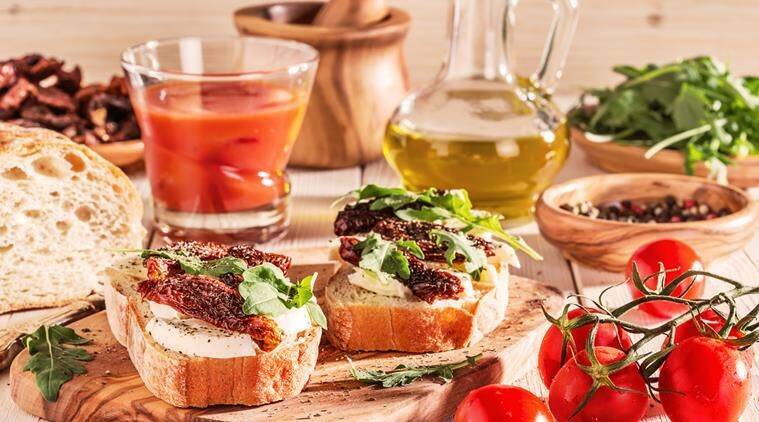 * Tomato and cheese bruschetta: Place sliced bread on a baking tray, drizzle extra virgin olive oil, chopped garlic and any dried spiceavailable in the kitchen cabinet, bake till golden brown. Top with chopped tomatoes, cheese and chopped basil. * Pizza pockets: Place pizza dough (cut in 3-inch diameter circles) on a baking tray, drizzle olive oil and chopped garlic, top with chopped tomatoes and pizza sauce, add generous amounts of big cubes of mozzarella and cream cheese. Fold to form a semi-circle (half moon) to seal the edges. Bake at 180 degree Celsius for six to seven minutes. Serve hot with cheese oozing out. * Banana prune and chocolate toasties: Slice a few bananas, get some Del Monte Prunes, break a fruit and nut chocolate bar into small pieces and mix them. Apply butter on both sides of sliced bread or sliced brioche, fill the banana, prunes and chocolate mixture and make toasties in sandwich griller. * Stuffed mushrooms: Mix breadcrumbs, chopped mushroom stems and grated Parmesan cheese with a table spoon of a pizza pasta sauce; stuff into mushroom caps, drizzle olive oil and bake at 400 degrees F for 30 minutes. * Asian lettuce wraps: To make the filling, heat oil in a large skillet over medium heat. Add onion, ginger, lemongrass and garlic, and cook for seven to 10 minutes, or until onions are soft and beginning to brown. Add tofu and water chestnuts, breaking tofu into small crumbles; cook for four minutes, or until heated through. * Chicken pineapple and olive spears: In a saucepan over medium heat, add the ketchup, soy sauce, honey, mustard, sugar, garlic and lemon juice. Bring to a simmer and cook gently until thickened for about 10 minutes. Set aside and cool.